Cultivation of carrots was greatly encouraged by the British and American governments during World War II for several reasons. They are easy to grow, they are very nutritious and they keep for several months. Not only that, they have a high sugar content making them tasty even when eaten raw. All those facts remain the same today and are all excellent reasons for growing carrots in your garden or allotment. Our carrot calendar, which can easily be adjusted to your area of the UK, will guide you though the carrot growing year ensuring a good healthy crop. The dates on this web page are set for average UK weather conditions which is the same as all other gardening websites. All other dates in this web site will also be adjusted. Your setting will last for many months / years and will still be set when you revisit this site. A quick word on carrot types to help understand the calendar. As far as sowing and harvesting dates are concerned there are two basic types of carrots, earlies and maincrop. Earlies are normally sown around April (average) time and take 12 weeks to reach maturity. Maincrop carrots are sown around May (average) time and take 16 weeks to reach maturity. It is quite possible to sow both types in April, however in general, early carrots are considered to be more tender and tasty compared to maincrops. Maincrop carrots however, will store for far longer than early varieties and are better suited to maturing later in the year. All sowing dates in the calendar below are the dates on which you can start to sow carrots. With carrots in particular, it's best to sow a few seeds every week in succession for four to six weeks rather than sow all the seed at the same time. This will avoid all the carrots maturing at the same time and extend the season of cropping. Carrots are classified as root vegetables for the purposes of crop rotation. It is essential not to grow them on the same soil in two years running. A three year rotation plan should be sufficient to avoid any build up of pests. For details of a suggested crop rotation plan, click here. For carrots sown early in the year it's important that they are grown in a full sun position. Carrots sown from April onwards will also prefer a full sun position but they will still grow well in partial shade. Carrots need a well dug and crumbly soil if they are to grow long and straight. Remove all stones and ensure that any large clods of earth are broken up. Heavy soils will need lots of organic matter dug in if carrots are to do well. Rather than a nitrogen feed they do best if an organic multi-purpose feed such as blood, fish and bone is worked into the soil at the rate of a good handful per square metre / yard a week or so before sowing seed. If you plan to sow carrot seed under cloches (see calendar above for the correct start dates in your area) it will greatly help them to germinate if you put the cloches in position two weeks earlier. This will warm up the soil and encourage the seeds to germinate. Some people doubt that this makes much difference but the increase in the soil temperature under the cloche can be felt with your hand. Remove the cloches a month or so after the seedlings appear. Sow the seeds of early varieties with cloche protection in the first to second weeks of March, early varieties without cloche protection in the first to second weeks of April and maincrop varieties in the first to second weeks of May. Don't sow all the seeds in one go, spread the sowing over 6 weeks or so to increase the cropping period. Carrot seed is very fine and it's easy to sow them too thickly. The disadvantage of this, cost aside, is that you will need to spend time thinning out the seedlings. Not only that but the very action of thinning them out is liable attract the unwanted attention of carrot fly which hone in on the scent of crushed carrot leaves. If you plan to sow unaided by hand then do your best to sow the seeds thinly. You can make this easier by mixing the seeds to be sown with a little sharp sand. This will decrease the amount of seeds sown. If you have the money then several varieties of carrot seed are sold on sticky tape with the intention of reducing the amount of thinning which is required. One company which does this is D.T. Brown. An entertaining alternative is to make your own sticky tape seed strips and instructions on how to this can be found here. To sow carrot seed draw a shallow line in the soil, about 1.5cm / ½in deep and thinly sprinkle the seed into the line. Water the soil if the conditions are dry and sprinkle fine soil lightly on the surface. Pat it down gently with your hands and mark to indicate what and variety has been sown. Rows of carrot seed should be about 10cm / 4in apart for slimmer early varieties and 15cm / 6in apart for larger maincrop varieties. However thinly you sow your carrot seeds there will always be too many seedlings so you will need to thin them. 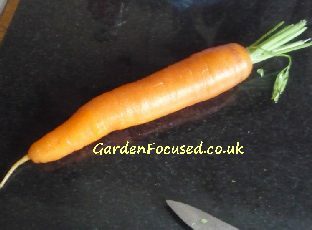 The final distance between each carrot should be 5cm / 2in for earlies and 7cm / 3in for the larger maincrop carrots. Thin the carrots as soon as they are large enough to pull them out. Thinning will crush the foliage of the ones you remove and this is what attracts carrot flies. To avoid their unwanted attention thin in the evening when they have "gone to bed", remove the thinnings well away from the carrots and water the remaining ones. Carrots require very little attention once they are growing. Weeding will clearly be required to reduce water loss and competition for nutrients. Water the plants if conditions become dry to avoid your carrots splitting and becoming woody. See the calendar above for expected harvest dates but this is very much a matter of opinion of taste. Young carrots definitely have the sweetest taste and are the most tender but they probably can be left to grow a bit bigger, it's really up to you. If you have grown maincrop carrots and plan to keep them during winter it's best to harvest them by mid October at the latest. If there is any sun at harvest time, allow the carrots to dry off on the ground for a day. Store them in sand in a cool, dry and dark place - they should keep for a month or two. Choosing particular varieties of any vegetable is always a personal opinion, tastes and other preferences will always vary. Below though is our list of carrot varieties which not only includes our preferences but also in depth research of the opinions of other individuals and organisations. Where there is a particular seed merchant offering seeds of a recommended variety at excellent prices we mention them. Seed merchants are selected not only on price but also postage costs, reputation and good coverage of vegetable seeds in general. A maincrop variety which begins cropping in mid to late October and has exceptional keeping qualities either in storage or left in the soil, resistant to frost damage. Awarded an RHS AGM in 2005 (reconfirmed in 2013) this F1 variety produces good sized carrots of a regular shape. Suttons Seeds sell this variety of carrot seeds, click here for details. An F1 early variety which has an RHS AGM in 2006 (reconfirmed in 2010). Tastes delicious with well-coloured and tasty carrots. Mr Fothergills offer this variety at 2.75p for 500 seeds. Another F1 early variety with a particularly sweet flavour, very pleasant texture and appearance. RHS AGM in 1993 (reconfirmed in 2013). This variety is also good for containers, growing to about 12cm / 5in long. Nicky's Nursery offers this variety at £2.15 for 350 seeds. The chief pest of carrots is without doubt the carrot fly. The only sure-fire way of avoiding attacks by carrot fly is to sow seed no earlier than June. That's the unfortunate truth. It's not all bad news however because there are a few measures you can take which will greatly reduce the risk of an attack by this pest. The first is to use a physical barrier to prevent the carrot fly from ever reaching your crop. After years of experimenting we recommend Enviromesh netting. A quick visit to gardening forums will show you that many other gardeners agree. Another key measure you can take is to thin your carrots the correct way. First choose a day when the air is still. Thin in the evening when the carrot fly is not about. Remove all thinnings far away from your crops. Pat down the soil where seedlings have been thinned and then water lightly to settle the soil down even further. There are several other preventative measures you could take such as planting rows of garlic / onions either side of your carrots but they are at the best, less effective. Another major enemy of those who grow carrots is wireworm. It is especially common where the ground was covered in grass during the previous year or two. Unfortunately, the damage done to carrots by wireworm will only become visible when the carrots are dug up. You will see small, dark-edged holes in your carrots where they have tunnelled in to feed. There are no chemicals available to the UK gardener for wireworm but several measures can be taken to get rid of them. Read our extensive article on identifying and treating wireworm which can be found by clicking here.